One of my favorite Seattle Bands, Black Whales, has made their recently released single available for free download for a limited time. "Vietnam" is a good song, so get busy. I had the great pleasure of seeing Bettye LaVette at the Portland Bluesfest last Saturday. It was a gorgeous hot day on the downtown Portland riverfront. Bettye, playing while the sun was beating down on the stage at the hottest point of the day, thanked people for coming and said "I wouldn't stand out there in this heat to see Jesus walk on the water." And while Bettye didn't quite walk across the Willamette River, she did remind me why she's my favorite living soul singer. She can belt out the rough soul rockers and then bring every last ounce of sympathy out of a ballad. And Bettye's stage presence is brassy, funny and utterly candid. If you run into at her and end up chatting her up, ask her about a night out drinking with Lucinda Williams. I love the lo-fi girl group garage sound of Teenage Burritos. We have two of their songs for you to enjoy, but first indulge me as I tell you what I know about them. They are from San Diego, and the members are Kirsten on guitar, Rachel on drums and Emily on guitar. As for other information....um...have I mentioned that they are from San Diego? I guess I have. OK, then, listen, enjoy, and look for more from this band. Actually, we do have a bit more information. The band will be releasing a tape in a few weeks on Burger Records. We think Burger Records has good taste, and we know that we have good taste, so that gives you two votes for Teenage Burritos. As for whether burgers and burritos are a good combination, that's a matter of individual preference, but it may cause you to increase your supply of condiments. I love summer soups. You know the kind -- chilled with a bit of spice and lots of different ingredients. It seems it can be a great template for an album as well. Exhibit A, is Alamalibu (June release on Skybucket Records), the recent EP from Birmingham, Alabama's Through the Sparks. Through the Sparks was formed in 2003, and has several LPs and previous EPs under their belt. The band is new to me, so I can't compare previous efforts. However, this EP promises you music born of two enduring styles, and ably delivers it. I highly recommend Alamalibu for your summer soundtrack. In addition to a fine sense of melody (and an accent Americans may find a bit thick), Shambles' songs tend to be characterized by a deft sense of humor. In that vein, and as an added feature, we've linked to another fine blog on which Shambles reports his experiences with speed dating (speed dating). The self-tiled release from Austin, Texas duo Deep Time manages a difficult feat: Nine songs of undeniably minimalist pop that still manage to give the listener good weight. It seems to me that Jenifer Moore and Adam Jones accomplish that task by paying careful attention to the structure of the songs, and then providing a more robust rhythmic element via drums and bass that one would expect in a minimalist genre. And ultimately, that prominent, almost tribal rhythm and Moore's vocals provide a otherworldly thrust that elevates Deep Time to a very interesting and satisfying listen. Expect the unexpected, vocalizations that go beyond lyrics, and changes in tempo, volume and atmosphere mid-song. While Moore's prior vocal work with the Carrots was more of the girl-group variety, her contribution here is a shadow-tinged indie styling that reveals her to be a strong and innovative vocalist. If you are the kind of pop fan that demands that an album choose its public face from the opening note and stick with it to the end, you'll likely appreciate, but not fall in love with this album (but if you are that kind of listener, you might not be reading this blog at all). For those that like some surprises, and don't mind been asked to think a bit while enjoying a good song, you'll like this one. This band originally was known as Yellow Fever, but were forced to choose a new name for legal reasons. Deep Time was recorded in Austin and released yesterday by Hardly Art. 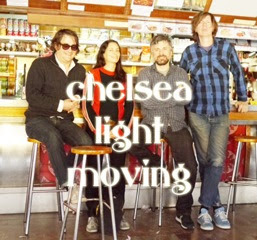 Chelsea Light Moving is the new project from Sonic Youth's Thurston Moore, including in addition to Moore (guitar/vocals/songwriter), Keith Wood (guitar), Samara Lubelski (bass) and John Moloney (drums). They've released a new song, "Groovy and Linda" - billed as a paean to the 60's counterculture scene in New York City, it features, in addition to some truly spectacular guitar shredding, the chilling repeated lyric "Don't shoot, we are your children"... You can download it free, courtesy of Matador Records, by clicking here. It's an intriguing and promising development, and it will be out on Matador in the fall. Milk Maid was founded in 2009 by Nine Black Alps bassist Martin Cohen. Initially the venture was a side project to provide an outlet for his own songwriting ambitions. The result was 2011's Yucca, an excellent mix of classic powerpop swathed in shoegaze and Jesus and Mary Chain distortion. Mostly No, which is released this week on FatCat Records, represents a step forward in several respects, and not only in that Cohen has resigned for the Alps to concentrate on Milk Maid. Cohen's songwriting on this album seems sharper and more assured. And while both albums were home-recorded, Martin used the live shows following Yucca's release to test and refine the songs on Mostly No with the touring band. It seems to me that the result is songs with more sonic range and more emotional swagger. For all its good points, and there were many, Yucca had a bit of a bedroom recording feel to it. A feel that I think Mostly No shrugs off despite its origins. This may be a sophomore album chronologically, but the development it represents indicates that this band can compete with the Ty Segall, White Fence and others who are reshaping the influences that keep us coming back to rock music. This is lo-fi indie, without synths or production gimmicks. Mostly No just delivers pop songs with hooks, noise and feedback. Is that what we wanted? Well yes, yes it is. And an additional bit of good news is that Cohen has begun writing Milk Maid's third album. If you are collecting rock and roll this year, Mostly No has earned a spot on your list. No, you haven't stumbled on a horticulture blog in error, this really is about music. In mid-February of this year Glasgow label and multi-media collective Flowers in the Dustbin held a two day event celebrating the contribution of Flower's artists to the underground indie scene in Glasgow. Flowers filmed it all for a documentary entitled The Glasgow Flower Show, and is launching the documentary with a 15 minute taster they call "the propaganda edition". The propaganda contains contributions from artist, bloggers, journalists, DJs and audience members, as well as clips of artists performing at the event. Two of those acts, Kick to Kill and Mummy Short Arms have feature on these pages in recent months (and if we'd been aware of For Able's Yorkshire when it was released last November, we would have covered that as well). Flowers in the Dustbin motto -- "be reasonable - demand genius" -- sets a high standard for the proceedings, and we think the event hurdles the bar with room to spare. It certainly will be of interest to fans of Scottish indie, but we expect that it will appeal more broadly to those interested in music We've embedded the propaganda edition below for your perusal. And we'll immodestly add that the alert viewer will note at about the six minute mark a clip from this blog's review of the Kick to Kill release.